PUPILS at Frenchay Church of England Primary School welcomed a very special visitor to help them celebrate the opening of their newly-refurbished library. World-renowned and award-winning children’s author Joanna Nadin was the guest of honour. Joanna, who has written more than 70 books, ran an assembly for the whole school where she talked about how she writes her stories. She then answered questions from the children before cutting the ribbon to officially open the library. The school's PTA have been working tirelessly to fund a huge variety of new books for the revamped room. Headteacher Mrs Marks even painted a mural on the wall, which was chosen from the children’s designs. Year 5/6 teacher and English leader Helen Shepherd organised the event. She said: "Joanna was brilliant. She really inspired the children by talking about how she gets her ideas for stories. The children are so enthusiastic about reading and are excited to be able to borrow from a wide range of brand new books. "I want to say thank you to Joanna and everyone else who has worked so hard to help us." 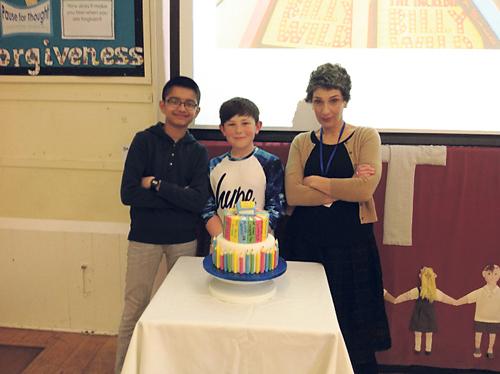 The occasion was also marked by an own clothes day and there was even a book-inspired cake, made by a parent Rachael Mather.